NOTES: Multi-media kit with resin and photoetched parts. The Meridionali (formally IMAM) Ro.37 design and production began in 1934. The Ro.37 was a biplane with unequal span wings and mixed construction of wood and metal, a fixed tail wheel and wheel spats for all three wheels. It was crewed by two and was intended as a two-seat fighter/reconnaissance aircraft. Originally, the Ro.37 was powered by 700-hp Fiat in-line engine. An improved version, the Ro.37bis was powered by a 560-hp Piaggio radial engine; the top speed was 205 mph at 16,405 ft with a service ceiling of 23,620 feet and a range of 696 miles. The Ro.37bis was armed with 2 fixed forward firing 7.7mm machine guns and a flexible rearward firing 7.7mm machine gun and could carry a bomb load of 397 pounds. Both the Ro.37 and Ro.37bis were quite popular and over 635 were built (160 Ro.37 and 475 Ro.37bis). Export orders were received from Central and South American countries as well as Afghanistan and Hungary. The Ro.37 and Ro.37bis were involved in the Spanish Civil War from 10/36 and were used extensively by the Regia Aeronautica during the invasion of Abyssinia between 10/35 and 5/36, and occupation of that country until 1941. When World War II started, 275 Ro.37 and RO.37bis were in service as follows: 30th Recon Flight at Palermo; 120th Recon Flight at Tirana [Albania]; 122nd Recon Flight at Mellaha; 136th Recon Flight (Tripoli); 127th and 137th Recon Flights at El Adem; 110th Recon Flight (Ro.37) at Addis Abeba; 27th Recon Flight at Casabianca; 42nd Recon Flight at Bari; 121st Recon Flight at Airasca; 131st Recon Flight at Napoli-Capodichino; 31st Recon Flight (Ro.37) at Venari Reale; 33rd Recon Flight at Bresso; 39th and 40th Recon Flights (Ro.37s) at Venaria Reale; 114th Recon Flight (Ro.37) at Tornino-Mirafiori; 118th, 123rd and 132nd Recon Flights at Levaldigi; 129th Recon Flight (mix Ro.37bis/Ca.311) at Mondovi; 24th, 35th and 115th Recon Flights (Ro.37) at Verona-Boscomantico; 25th Recon Flight (Ro.37) at Jesi; 28th Recon Flight (Ro.37) at Lucca-Tassignano; 29th Recon Flight (Ro.37) at Arezzo; 32nd and 125th Recon Flights at Udine-Campoformido; 34th and 128th Recon Flights (Ro.37) at Parma; 36th and 87th Recon Flights (Ro.37) at Padova; 38th and 116th Recon Flights at Gorizia-Merna; and 113th Recon Flight at Bologna-Borgo Panigale. The Ro.37s saw front-line action in the North African campaign, the Balkans and on the Eastern Front. After they were withdrawn from front-line service, RO.37's were used as utility planes and ambulances and at the time of the armistice on 9/8/43, had been completely retired from service. Many thanks to Commando Supremo for that historical background. Since the main difference between the two variants is just the engine, this was a good choice for doing two kits; one of the earlier and more powerful Fiat in-line engine, and one of the less powerful but more reliable Piaggio radial. The vast majority of the parts are injected plastic and that includes the windscreen and other clear bits. The detail level of the parts is super. The fabric representation is properly toned down without the 'hills and valleys' that used accompany a fabric airplane kit. Other than the usual ejector towers, the kit is free of flash and I found no sink areas. One can tell when a company is progressing as it relies less and less on non-plastic parts. Thankfully, the vacuformed bits are a thing of the past from Classic Airframes. 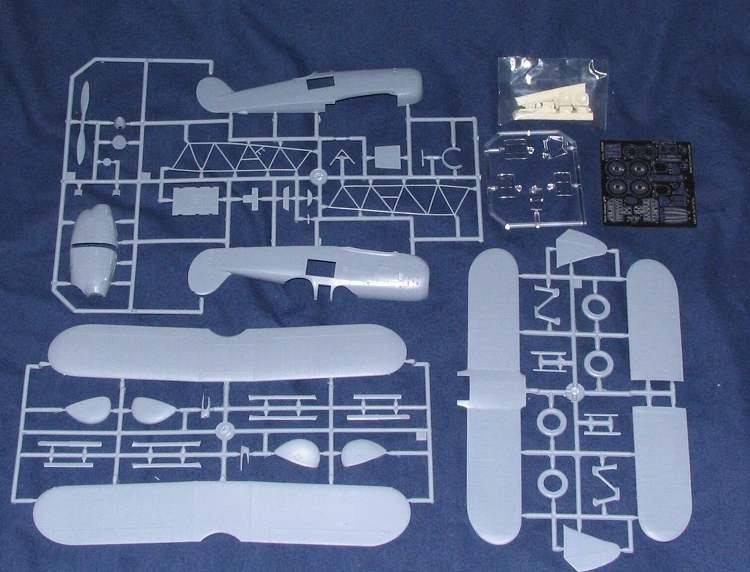 However, it is still easier to produce some items from exotic materials and in this case, the finer parts such as seats, gun, rudder pedals, tail wheel and a few other smaller cockpit items are in resin. For the 37bis, the Piaggio engine is provided in resin as well. The etched fret is the same for both planes and provides bits for the instrument panels (along with acetate instruments), seat harness, gun sight and the wire part of the wheels. These last items look really neat and the instructions seem very straight forward on building them. It would almost be a shame to hide them in spats so there is an option to leave those off. A full framework is provided for the interior, much like what was given in the excellent Hurricane I kits. To install the Fiat cowling, a section of the kit nose has to be cut off, but is should be pretty easy for most of us. Instructions are very well done with 12 construction sequences. There are smaller info drawings to help us align things up properly as well. Color information is provided throughout the build process. What isn't given is a rigging diagram, though the image on the box tops is sufficient. This is a single-bay biplane so rigging isn't that complicated. One thing I like is that in just about every construction step is the recommendation to test fit every part. For kits like this, that is the best piece of advice that one can give and it will prevent all sorts of problems during the build. For markings, I'll start with the RO 37. First I'll mention is the box art 5 gruppo aircraft based in Montenegro during 1942. It is in Green with brown mottles over light blue-grey. It has a yellow nose as required in the Balkans. The instructions give the proper Italian names, but I'm not here to impress you with my ability to copy difficult to pronounce n ames! Next is a 72 gruppo plane in Coritza during 1941. It is in camouflage yellow (tan) with green and brown mottling and a blue-grey underside. Finally, another 5 gruppo plane in a segmented camouflage of camouflage yellow, green and brown over blue-grey. This one has white under the wing insignia and a template is provided for you as you'll have to paint it on, unless you have white circles of the proper size. 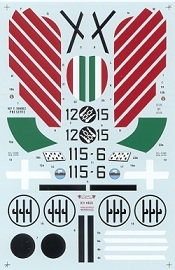 With the RO 37bis, there are also three sets of markings. First up is the box art plane from Spanish Nationalist Air Force in 1938. It is in camouflage yellow with green spray camo and a light blue-grey underside. White wing tips are part of the scheme. Next is a 115a squadriglia plane in North Africa during 1940. It is also in camo yellow with green mottling over light blue-grey. As with all Mediterranean theater planes, it has a white fuselage band. The final scheme is XXVI gruppo plane in Ethiopia during 1935. This one is overall ivory white with a green fuselage band and the old style rudder stripes. It also has red upper wing stripes. There is a template provided so that you can properly space these stripes. It should make for a rather striking aircraft. Decals for both versions are printed by Microscale and are superbly done. Well, I know that a lot of people are looking forward to these kits and so here they are. They look like they'd be very nice builds and I'll have a full build report on them on the earliest opportunity. They'll surely be something to stir the conversation at the next club meeting or contest.